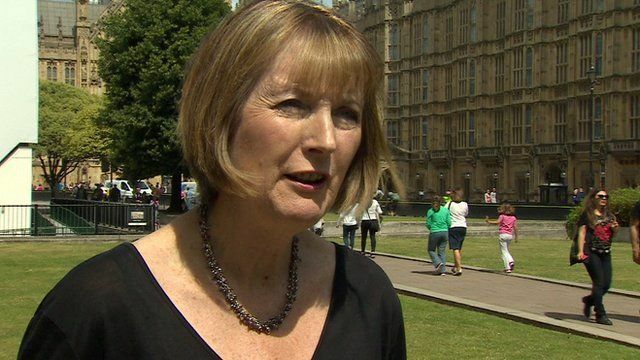 'PM woefully slow on Calais crisis' Jump to media player David Cameron has been "woefully slow" in dealing with the Calais migrant crisis, according to Labour's acting leader, Harriet Harman. UK sends dogs and fencing to Calais Jump to media player Extra sniffer dogs and fencing will be sent to Calais to help deal with the migrant crisis, the prime minister has announced. 'Over 1,000 attempts to break through' Jump to media player For the fourth consecutive night in Calais, migrants jumped over fences and climbed onto lorries and trains heading through the Eurotunnel. PM: Migrant crisis 'needs more work' Jump to media player After chairing the government's emergency committee, Cobra, Prime Minister David Cameron admits that ''more work'' needs to be done to tackle the migrant crisis in Calais. M20 drivers face 18-hour queues Jump to media player The migrant crisis in Calais means that some drivers are facing delays of up to 18 hours before they can enter the tunnel on the UK side. 'Too many to count' through Calais fence Jump to media player Migrants have once more broken through police lines in Calais trying to enter the Channel Tunnel. Inside 'The Jungle' migrant camp Jump to media player Thousands of people have tried to enter the Channel Tunnel in Calais, France, in an attempt to get to the UK. Martin went to the French town to find out more the growing migrant crisis there. 'Britain remains the promised land' Jump to media player Hundreds of migrants who have made the journey from North Africa to Italy, are currently in Calais in the north of France, but for many of them, "Britain remains the promised land." One night by the Calais security fence Jump to media player The BBC's Paul Adams spends one night with some of the migrants trying to gain access to the rail tracks that run through the Channel Tunnel. David Cameron has been "woefully slow" in dealing with the Calais migrant crisis, according to Labour's acting leader, Harriet Harman. She has written to David Cameron calling for compensation from the French government for Britons affected by the Calais crisis. Speaking to Carole Walker, Ms Harman said that the UK government had "ignored repeated warnings" about the worsening situation.